Now if there's one thing you can be sure of, it's that nothing is more powerful than a young boy's wish. Except an Apache helicopter. An Apache helicopter has machine guns AND missiles. It is an unbelievably impressive complement of weaponry, an absolute death machine. There have been a lot of wishes-come-true in movie history: a puppet who wanted to become a boy, a boy who wanted to become a man, a man who wanted to become a prince (bonus points if you can name the three movies we’re talking about), but only one where a teddy bear was willed into sentience.Ted was hilarious because the titular toy bear became as debaucherous as the rest of us do with the years. Most wishes don’t result in drunken, potty-mouthed animals. Mr. Disney would never have allowed it. But Mr. MacFarlane -- well, he’s a different story now, isn’t he? 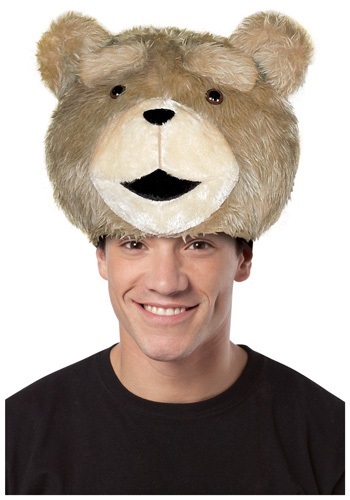 Our Ted Headpiece is the perfect way to show others that your spirit animal also knows how to party. Its realistic bear-like fur and deceptively gentle face is sure to warm the hearts of everyone around you. With this hat all you’ll need is Patrick Stewart to follow you around and narrate everything you do and you’ll be the life of the party!